DeLena Ciamacco: The Real Estate Expert: NEW LISTING IN OSTRANDER! BRING HORSES, CARS OR BOTH! 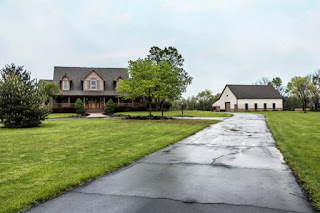 Nearly 10 acre horse/hobby farm with 5 acres of fenced pastures, stocked pond and barns! 56 X 47 main barn has space for 4-6 stalls. 32 X 24 storage/equipment barn. 3rd section has a large heated workshop! ~3,700 SF (on 3 finished levels) custom home with wood floors everywhere! Two-story Great Room has floor to ceiling stone wall with pellet stove. First Floor Master Suite has walk-in closet and private shower bath. 1st Floor Den. Island Kitchen with wrap around hickory cabinets. Finished, walk-up basement, has Billiards/Recreation Room and more! 4 BR’s and 2.5 Baths. Buckeye Valley schools. Only $574,900! Call DeLena Today!